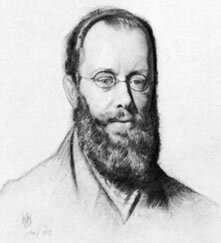 Edward Lear (1812 -1888) was born in Highgate, London, the 20th son of a stockbroker. Rejected by his mother, Edward was raised by his sister Ann who was 21 years his senior. A sufferer of epileptic seizures, which Lear termed ‘the Demon’, from the age of six, he was also prone to sudden mood changes and bouts of acute depression when he called ‘the Morbids’. Educated by his sisters, Ann and Sarah, Lear showed promise as an artist from an early age. Due to the failure of his father’s career and his inability to provide for his family, Lear began to earn a living as an illustrator from the mid 1820s. In 1848 Lear began a journey through Greece and on to Constantinople. From there his journey took an unexpected turn, the British ambassador in Constantinople managed to get the requisite papers for him to travel through what was then considered the wilds of the Ottoman Empire. Taking a route that passed through Thessalonika and Monastir he continued on to Ohrid, Struga, Elbasan, Tirana, Kruja, Lezha and Shkodra. After several days there, he returned to Tirana and continued southwards to Kavaja, Berat, Ardenica, Apollonia, Vlora, the coast of Himara, Tepelena, Gjirokastra and on to Ioanina. Many of the landscape paintings and sketches he made during the journey provide an accurate topographical record of mid-nineteenth century Albania. On his return to England he published Journals of a Landscape Painter in Albania (1851). Lear had a wild enthusiasm for the extraordinary landscapes he encountered during his wanderings and a sharp eye for the quirks and curiosities of his fellow men. His original talent as a landscape painter coupled with his lively travel books and delightful correspondence makes Lear one of the most endearing of all the nineteenth-century travelers. "To the unlearnt tourist, indeed, Albania is a puzzle of the highest order. Whatever he may already know of ancient nomenclature- Epirus, Molossia, Thesprotia, etc.-is thwarted and confused by Turkish divisions and Pashaliks; beyond these, wheel within wheel, a third set of names distract him in shape of native tribes and districts - Tjamouria, Dibra, etc. And no sooner does he begin to understand the motley crowd which inhabits these provinces -Greeks, Slavonians, Albanians, Bulgarians, or Vlachi -than he is anew bewildered by a fresh list of distinctive sub-splitting, Liape, Mereditti, Khimariotes, and Toskidhes. Races, religions, and national denominations seem so ill defined, or so entangled, that he would give up the perplexing study in despair were it not for the assistance of many excellent books already published on the subject. "